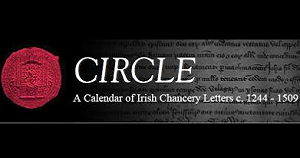 CIRCLE (A Calendar of Chancery Letters) is the culmination of nearly four decades of work reconstructing the lost medieval Irish chancery rolls, which were destroyed on 30 June 1922 in an explosion and fire in the Public Record Office of Ireland, located at the Four Courts, Dublin. It brings together all known letters enrolled on the Irish chancery rolls during the Middle Ages (1244–1509) drawing on originals, facsimiles, transcripts and calendars located in archival repositories in The Republic of Ireland, Northern Ireland, England and the USA. The site contains over 20,000 Irish chancery letters translated from Latin into English, together with an unparalleled collection of digital images of surviving medieval chancery letters and rare printed volumes.